Hiya pals! If you are looking for gift ideas or looking to expand your own Disney game collection, I have a few games to show you from Wonder Forge. First up is Surprise Slides. 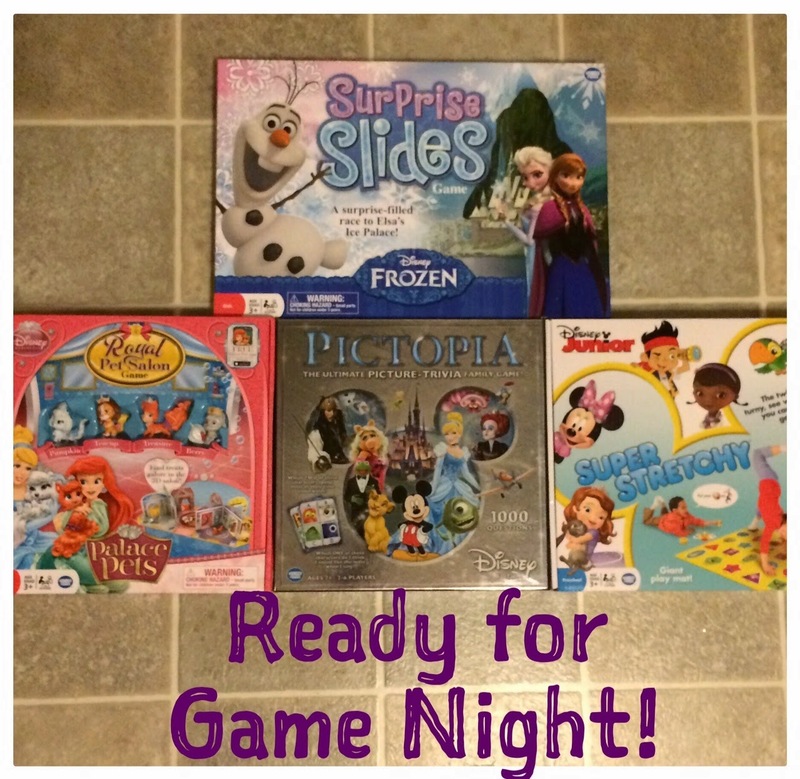 The game reminds me of a cross between Chutes and Ladders and Candy Land but with its own unique twists…and Frozen! We all like the colorful board. To play, you spin and move to the next available corresponding space. The colored blocks simply move you forward. The snowflake blocks can send you up or downstream depending on where the arrows tell you to go. What really makes this game unique are the tiles within the board. Sometimes your spinner will tell you to flip all of the tiles over and sometimes you are to mix them all up. This changes the path of the streams. I think this would really extend the appeal of the game to older children. We did have to stop flipping them at my house because we were playing with a three-year-old and she only has so much patience. Also, there is one side of a tile with wolves on it and Tink didn't want us to show that one at all. I appreciate having a spinner instead of a stack of cards to keep up with. Simple is good. Aren't they cute? I like how the stands are ice blue to go with the theme. Overall, Surprise Slides is a really fun game. My five-year-old got in to it and my three-year-old stayed with us for a while. This is an entertaining way to practice taking turns, matching colors, following instructions and winning or losing gracefully. 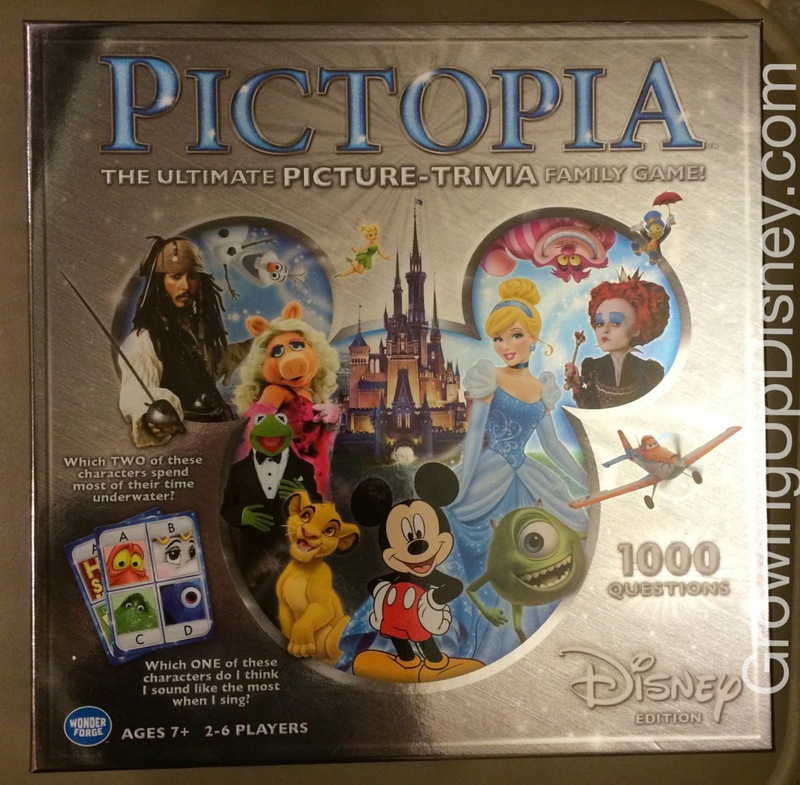 Pictopia is a Disney trivia game covering movies, television and parks. For this game, we had 4 adults and the kids came and went. They were mostly interested in the Mickey shaped playing pieces. To play the game, the "host" rolls the dice and moves the indicated number of spots. The image he/she lands on will tell which question will be read. Each card has four images on the front and a series of questions on the back. The host holds up the card to show the four images and the other players bet based on how well they know those characters, places, etc. If you get the question right, you move forward the number on your bet coin. Some of the questions are geared toward working together as a group and others make you dig through your Disney trivia knowledge bank alone. There are even questions where you see how well you know the person who is reading on that turn. We all had a lot of fun playing Pictopia. We learned that my husband has picked up quite a bit of Disney information since he joined the family. It's a pretty fast moving game, which makes it nice to work in after dinner. You don't have to set aside hours like some other trivia games. But we did sit around the table asking more questions from the cards after the official game was over. There are 1000 questions and I've thought about putting some of the cards in my purse to kill time with Tink at restaurants or before doctor's visits, etc. The game is officially recommended for ages 7 and up. If you are playing the full game, I would totally agree with that. However, Tink is five and she loved answering the questions, even though she didn't get what was going on with the bet coins and such. She became Daddy's secret weapon to getting them all correct. 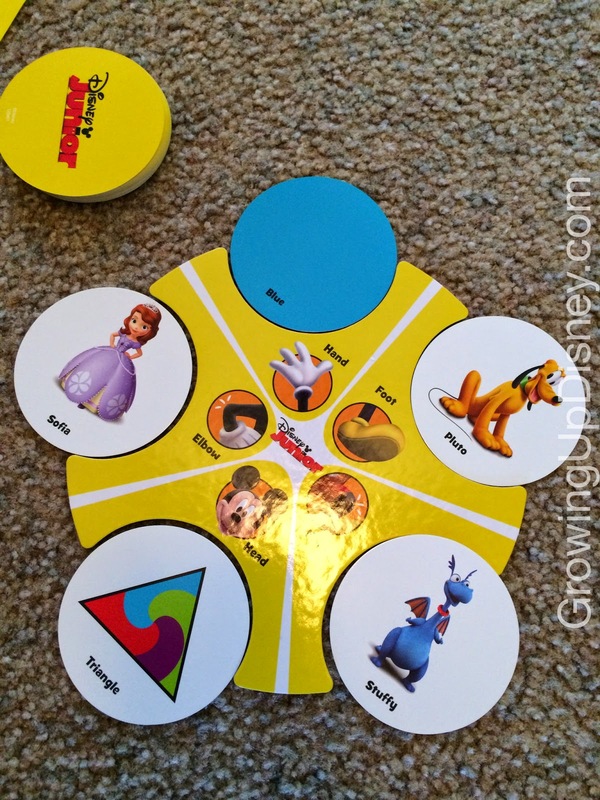 This game would be a wonderful gift for any Disney trivia fan or family looking for some game night fun. Remember how I mentioned that we need to work on winning gracefully? This was mid-celebration dance. The last game I will review today is Super Stretchy. If you have little ones, run out and get this game. My girls have asked to play it almost every day since I opened the box. Super Stretchy is a Twister-like game that is perfect for Disney-loving youngsters. They get to wiggle, be silly, and look for their favorite Disney Junior characters. The play mat is very durable and colorful. I've already had to clean mine (my kid's fault, not the game) and a Clorox wipe made it good as new. Tink also scrunches the mat a bit trying to get every body part in the right place and the mat still looks nice. There are cards showing each character from the mat, as well as shapes and colors. The "caller" puts one card on each section of the star and calls out those instructions to the "stretcher." And for those preschoolers who aren't solid on which is right and left yet, no worries because they use foot, knee, hand, elbow, and head in the game. I love that last one. It's usually pretty funny when the girls try to get their head on the right spot. Of course, they wanted to play in Cinderella and Belle dresses. That's pretty much regular attire around our house. I've been really pleased with how long the kids will stick with this game and it's been a wonderful source of indoor exercise during the cold days we have had recently. I love Super Stretchy. 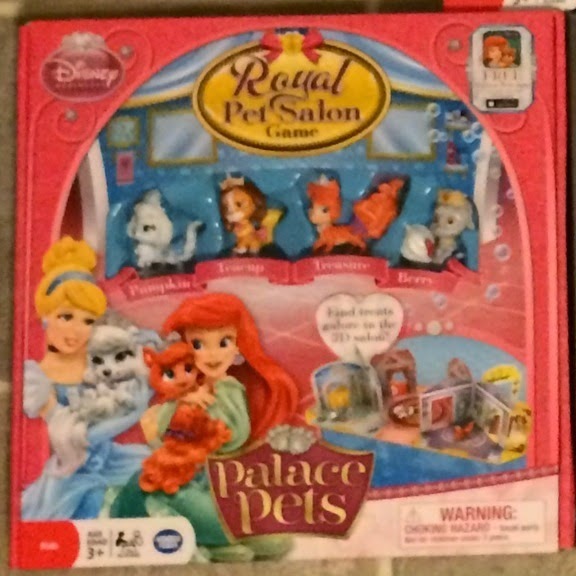 There are no batteries, the kids get exercise, we can work on colors and shapes, they giggle a lot while playing the game, and it includes Disney Junior characters. I will update you on this one soon. I wanted to let Tink play this one for the first time with her 9-year-old cousin over Thanksgiving weekend. I am interested to see how Cousin K takes to the game. I know Tink will lose her mind over the figurines that come in the box. Many thanks to Wonder Forge for providing these games for my review! These are my honest thoughts and no other compensation was offered or received. The post does contain links to Amazon. 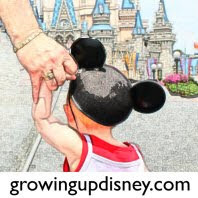 If you purchase through our link, it helps offset our operating costs at Growing Up Disney.